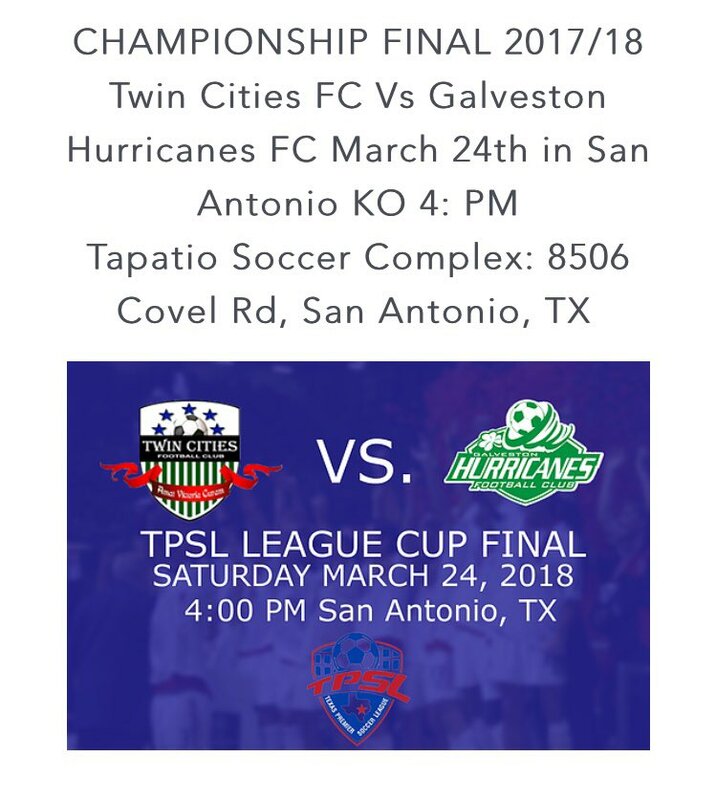 The regular season of the Texas Premier Soccer League (TPSL) culminates this Saturday when Galveston Hurricanes FC and Twin Cities FC from border city Eagle Pass compete for the TPSL League Cup Final in San Antonio. The match will kick off at 4:00 p.m. at Tapatio Soccer Complex. Stadium location details are in the image at the bottom of this post. The original TPSL was formed in 1997 and folded ten years later. The league came back to life and resumed play in 2013 with 6 clubs. TPSL is the only high-level amateur league in the state that consists of teams solely based in Texas. This will be the fifth year that the League Cup Final will be contested in the reformed league. A new champion will be crowned for the 2017/18 season since three-time defending Cup holders Austin Real Cuahutemoc were eliminated in the semifinals this year. The two sides split the games played, with both teams winning on the road. Twin Cities 2-0 and the Hurricanes 3-1 (the only loss suffered by Twin Cities FC all year). Right Back: Ian Villarreal-17 years old. This will be Twin Cities FC 4th consecutive trip to the Championship game. The team lost the previous three to Austin Real Cuauhtemoc. Like to play a 5-4-1 and push the wing-backs up into space vacated when the opposing team pushes high up the field. The Hurricanes will also be looking to win their first Championship-this will be the first time they have made an appearance in the finals. Galveston typically plays a 3-5-2 at home and adjusts as needed on the road. The team plays an attacking and possession based style and likes their wingers to get up and down on both ends of the field. As noted by Twin Cities coach Gonzalez, the Hurricanes attempt to dominate the midfield and force the match both in the attack and on defense.